In the late 1980s, a handful of artists priced out of Manhattan and desperately needing affordable studio space discovered 111 1st Street, a former P. Lorillard Tobacco Company warehouse. Over the next two decades, an eclectic collection of painters, sculptors, musicians, photographers, filmmakers, and writers dreamt and toiled within the building's labyrinthine halls. The local arts scene flourished, igniting hope that Jersey City would emerge as the next grassroots center of the art world. However, a rising real estate market coupled with a provincial political establishment threatened the community at 111 1st Street. The artists found themselves entangled in a long, complicated, and vicious fight for their place in the building and for the physical survival of 111 1st Street itself, a site that held so much potential, so much promise for Jersey City. 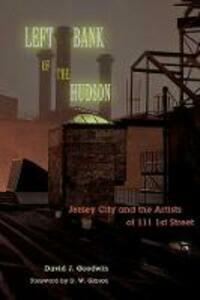 Left Bank of the Hudson offers a window into the demographic, political, and socio-economic changes experienced by Jersey City during the last thirty years. Documenting the narrative of 111 1st Street as an act of cultural preservation, author David J. Goodwin's well-researched and significant contribution addresses the question of the role of artists in economically improving cities. As a Jersey City resident, Goodwin applies his knowledge of the city's rich history of political malfeasance and corruption, including how auspicious plans for a waterfront arts enclave were repeatedly bungled by a provincial-minded city administration. In writing this story, Goodwin interviewed thirteen artists and residents, two businesses, three government officials, and five non-profits, civic organizations, and community activists. The book chronologically explores the history and business of the P. Lorillard Tobacco Company, its evolution into a bustling arts community, the battle to preserve the warehouse as a historic structure, and the lessons to be drawn from the loss and ultimate demolition of the building in 2007, as well as the present state of the neighborhood. Setting the facts straight for future generations, Left Bank of the Hudson provides an illustrative lesson to government officials, scholars, students, activists, and everyday citizens attempting to navigate the "rediscovery" of American cities.